Brown And Ivory Giraffe Style Print / All Over Pattern. Very Nice! Armpit to armpit 21. Type Blazer. Material Wool. Discover daily new arrivals in all seasons, sizes and styles that you can't find anywhere else. Item Details. Color Blue/Navy. 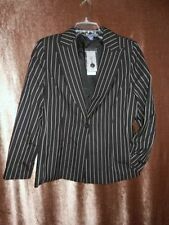 Size 8 petite Austin Reed Women’s Blazer/Jacket. Details shown in pictures. Perfect elements of red. Type Blazer. Material Wool. Discover daily new arrivals in all seasons, sizes and styles that you can't find anywhere else. Color Black. All details of the product have been included. Item Details. Material 100% Worsted Wool. Maker Austin Reed Hanger 456. Pit to pit 20.5" Pants 31" x 28". Condition Pre-owned. 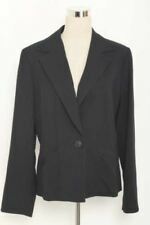 BACK BLAZER WIDTH: 16-1/2" (EDGE OF SHOULDER TO EDGE OF SHOULDER). SKIRT LENGTH: 38-1/2" (FRONT SLIT BEGINS AT 22" FROM TOP OF SKIRT). BACK BLAZER LENGTH: 26-1/4" (FROM BOTTOM OF COLLAR TO BOTTOM OF HEM). 100% Camel Hair Blue Blazer. Sz 10 by Austin Reed. NEW! BLUE/WHITE OPEN JACKET. LENGTH 25". SLEEVES HAVE SPLIT. A CLASSIC AUSTIN REED OPEN DRESS COAT/LONG JACKET SIZE L. LENGTH 32" BUST 20". NEAR NEW CONDITION. It's in excellent condition, just needs steaming and a lint brush to it or dry cleaning. When you are finished, you can check out. Length (down the center of the back): 27". We believe that pictures speak louder than words and do our best to show several photographs of each item, including any flaws we find. Excellent Condition Classic Houndstooth Blazer w/ Scarf. Bottom of back neckline to bottom of blazer is 23". Underarm to underarm is 19". Shoulder seam to shoulder seam is 16". Sleeves have slit. Open front - no zippers or buttons. Woven material with larger pattern weave. Navy Blue Lining. Two sections on the jacket front and a little on one arm. Open front. Chest, armpit to armpit 19. Length, top shoulder to hem 25. It needs to be cleaned, dry clean only. PANT HAS ZIPPER CLOSURE. MATERIAL: 93% WOOL; 4% POLYESTER; 3% ELASTANE. LENGTH ON JACKET-24". LENGTH ON PANT-38". COLOR: BLACK/WHITE. Detail: Career open blazer in abstract floral print. The sleeves are cuffed and knotched. Fully lined. There is an inside pocket on the left side. Bust19" pit to pit. Style: Open Blazer. Length 27". 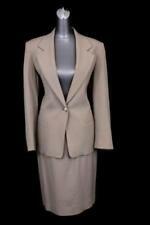 It is a brown and black blazer that has a collar, long sleeves and buttons in the front. It is lined. Side to side under the armpits is about 25", double that for all the way around. Shoulder to the bottom is about 28". Jacket is single breasted, lined and has faux front pockets. Material: Wool Blend. Inseam: 14". Pre-Owned Condition: Great. Sleeves: 24". Shoulder/Shoulder: 16". Color: dark gray with tiny pink stripes. Fabric: 52% viscose 36% polyester 10% wool 2% elastane. Closures: one button. Chest: 40". Check out this beautiful blazer/jacket, by Austin Reed. It has a button front closure, with twin front slit pockets, and is fully lined for your comfort. 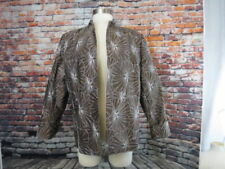 This jacket is very gently worn, and is in excellent condition. This little jacket is in like New Condition! a thin blue and white trim along it's edge. Material: 100% Wool - Seasonless Fabric. (down center of back): 27. Color: Red. (seam to seam across back): 17. We believe that pictures speak louder than words and do our best to show several photographs of each item, including any flaws we find. 100% all season worsted woo/poly acetate lined. All clothing must be free of major defects. We do our best to describe color, but many computer screens display colors differently. Length Shoulder to Hem: 30". 4% Acrylic. L sleeve - 20". From Armpit to armpit -20". Waist - 38". 55% Wool, 38% Viscose, 7% Nylon. Length 21". Pin-striped suit. The size seam of the skirt needs to be repaired. See photo. AUSTIN REED Blazer. 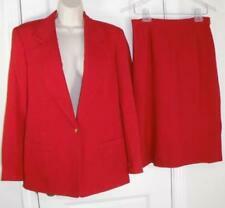 Length (collar seam to bottom hem of blazer): 22.25”. Blue, Orange, Pink & Yellow. Sleeve Length (top shoulder seam to hem): 23”. Shoulder to Shoulder: 17”. Historically the recipe was simple: a suit, a shirt and a tie - and we still do this better than anyone, we’ve had years of practice after all! Black Double Breasted Blazer. Austin Reed. About Austin Reed from their website. It would be between mid 70's and mid 90's I think. Pure new wool with a herringbone pattern in light brown with a subtle colorful blend of mauve, blue, cream, etc. Skirt has a slight A-line. Back zipper. Pattern: PLAID. lined, pockets, velvet accents. __" width across hem/along the bottom. __" width across waist seam area. __" width across arm pit to arm pit. __" width across the top, shoulder seam to shoulder seam. Length: 27". Sleeve: 23". Waist: 19". Austin Reed one button blazer, stretch. length of sleeve:24". length across waist:16". Austin Reed Jacket in cool colors. Navy, blue and mint. Fully lined. Hidden front pockets. One button on each sleeve. 4 front button closure. Austin Reed Double-Breasted, Plaid Print Blazer. Shell: Polyester (44%), Wool (37%) and Rayon (19%). Nice Blazer for Work or Casual. Felt Lining Under Collar. Front Flap Pockets with One Inside Pocket (Still Sewn Together, But Can Be Usable, If Unthread). Jacket – Size 8 - is in 100% wool gabardine black fabric and has 1 gold-colored button in front, 4 buttons on each sleeve, 3 pockets in front and one inside. It is fully lined with an acetate lining. LENGTH 20". PADDED SHOULDERS. ACROSS SHOULDERS 16". SLEEVES 24". ACROSS BOTTOM 38". WAIST 36". Minor wear. In excellent condition. Stunning Suit Jacket! I would call this color a dark taupe but see pics. We believe that pictures speak louder than words and do our best to show several photographs of each item, including any flaws we find.